"A new twist on an old favorite. 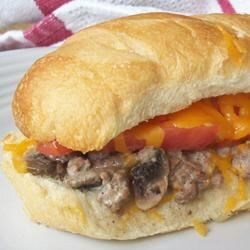 Beef stroganoff on bread, a quick and tasty recipe that is a little bit different." Cut loaf in half. Wrap in foil and heat at in a preheated 375 degrees F (190 degrees) oven for 10 to 15 minutes. In a large skillet over medium-high cook beef and green onions until beef is cooked through; drain. Stir in milk, garlic powder, sour cream, Worcestershire sauce, salt and pepper to taste. Heat but do not let boil. Butter cut surface of bread. Spread with half of meat mixture on each half. Arrange tomatoes and green bell pepper alternately on top and sprinkle with cheese. Place on baking sheet. Bake at 350 degrees F (175 degrees C) for 5 minutes or until heated through completely. Sorry, this recipe was rather tasteless and very messy. We ate a "sandwich" each, then tossed the rest.